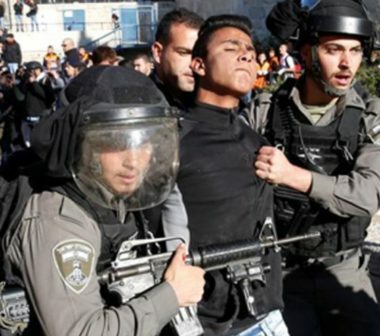 Israeli soldiers abducted, on Wednesday at dawn, five young Palestinian men from the al-Isawiya town and the al-Judeira village, in occupied East Jerusalem. The soldiers invaded and searched many homes in the al-‘Isawiya town, and abducted Majd Ali Ata, Khaled Abu Ghosh, Wasim Dari and Saleh Abu Assab. Another Palestinian, identified as Bashar Saed Barjas, was abducted from his home in the al-Judeira village, northwest of Jerusalem. In related news, the Wadi Hilweh Information Center in Silwan (Silwanic), said that its lawyer, who specialized in the cases of child detainees, said the Israeli police released Ahmad al-Hadra, Mohammad al-Jolani and Rashad Sa’id, after issuing orders barring them from entering the Old City for sixty days. Furthermore, the soldiers abducted three young Palestinian men from Tulkarem governorate in the northern part of the occupied West Bank.